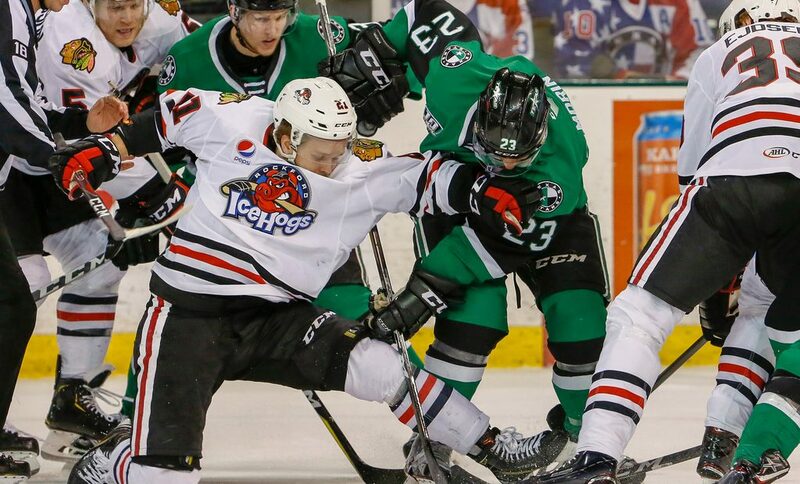 The Rockford IceHogs dropped the first two games of what will be a three-game road trip in Texas. The IceHogs picked up a standings point Friday against the Texas Stars, but lost that game in Gus Macker Time before losing the following night in San Antonio. In losing 4-3 to the Rampage, San Antonio leapfrogged the Hogs in the Central Division standings. Rockford (16-16-3-5) is now in seventh place in the division. Defenseman Neil Manning was brought back from the Indy Fuel of the ECHL on Wednesday. Going to Indy (on paper at least) was defenseman Luc Snuggerud, who returned to the Hogs the following day. Snuggerud has been inactive since a concussion suffered on November 3. Perhaps this is a sign that he is ready to begin skating in Indy or Rockford soon. Also being assigned to the Fuel was forward Matheson Iacopelli. 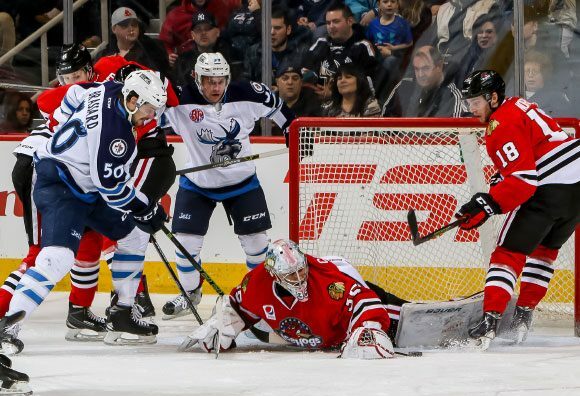 Like last season, Iacopelli has found it difficult to secure steady ice time in Rockford. He’s appeared in 25 games with the IceHogs this season with two goals and two assists. On Sunday, defenseman Brandon Davidson was loaned to Rockford by the Blackhawks after he cleared waivers earlier this week. 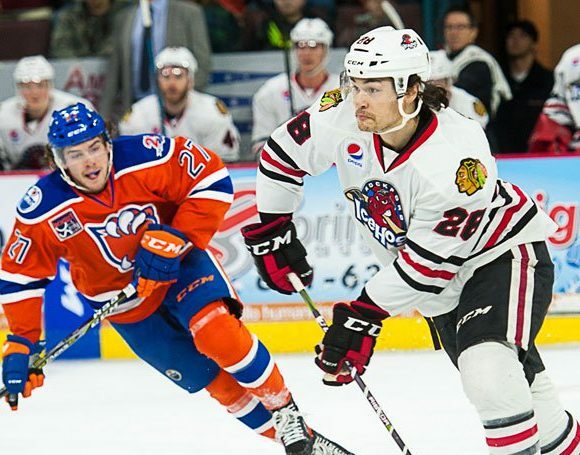 Jan Rutta, who Chicago had sent to the Hogs a month ago, was traded Friday to Tampa Bay. This back and forth contest was settled in penalty shots, where veteran Stars forward Travis Morin got the only puck into a net to limit the Hogs to a point in the standings. Texas took a 1-0 lead with a power play goal by Joel L’Esperance, who put a rebound past Rockford goalie Kevin Lankinen at 12:41 of the first period. The IceHogs drew even late in the period while on the man advantage. Lankinen had just stopped a shorthanded attempt by the Stars James Phelan. Rockford came down the ice, scoring with 44 seconds left when Dylan Sikura knocked in a pass from Andreas Martinsen. Denis Gurianov put Texas up 2-1 midway through the second period. Late in the period, Nathan Noel tied the game with an outstanding individual effort for a shorthanded goal. An Anthony Louis power play goal 4:38 into the third period gave Rockford a 3-2 advantage. Texas, however, tied it up at 15:42 with Gurianov’s second goal of the night. It was a scoreless overtime before Morin beat Lankinen in the shootout. Viktor Edjsell, Sikura and Louis all came up empty on their attempts. Jordan Schroeder had a two-goal evening…but so did the Rampage’s Jordan Nolan. The veteran’s three-point night proved to be too much for the Hogs. Trevor Smith hit a one-timer from the slot that zipped past Rockford goalie Anton Forsberg and into the net 7:43 into the opening period. The IceHogs tied the score early in the second. Luke Johnson dropped a pass to Dylan Sikura above the right circle. His attempt found its way past San Antonio goalie Jared Coreau at the 1:29 mark. The Rampage built a 3-1 lead in the second period on strikes by Tanner Kaspick and Nolan. The IceHogs closed the gap to 3-2 4:23 into the third after a faceoff win by Johnson. Schroeder gathered in the puck in front of the San Antonio crease and lifted home the goal past Coreau’s blocker. San Antonio caught the Hogs napping midway through the third. Nolan took a stretch pass from Joey LaLeggia, skated to the high slot and beat Forsberg to the cord for a 4-2 Rampage lead at the 11:05 mark. Schroeder got his second goal with ten seconds to play with Forsberg on the bench, assisted by Darren Raddysh and Viktor Ejdsell. Unfortunately for Rockford, time ran out on the comeback bid. The IceHogs finish the road trip with a rematch with the Rampage on Tuesday night. 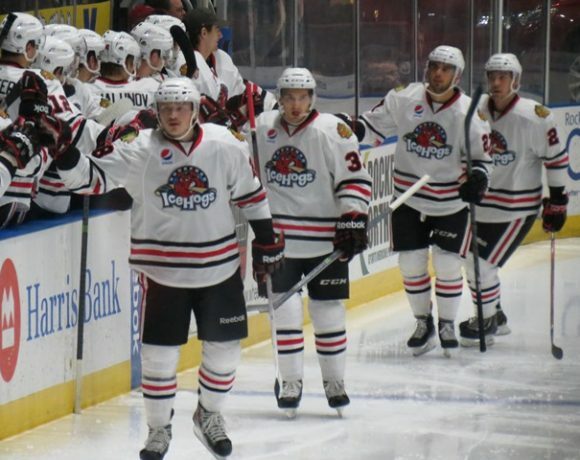 Rockford then comes back to the BMO Harris Bank Center for a Friday tilt with Grand Rapids. Saturday night, the Hogs visit Rosemont for a game with the Wolves. High On The Hog: Who’s In Goal For The Playoffs?